You are welcome to run with us for a couple of weeks to make sure you enjoy running with us. After that, we would request that you become a member. Please note: this page is for new members joining the club. Renewal fees for current members are on our Membership Renewal page. Anyone running with the club, at training nights and/or races, must sign up as a Runner Member. 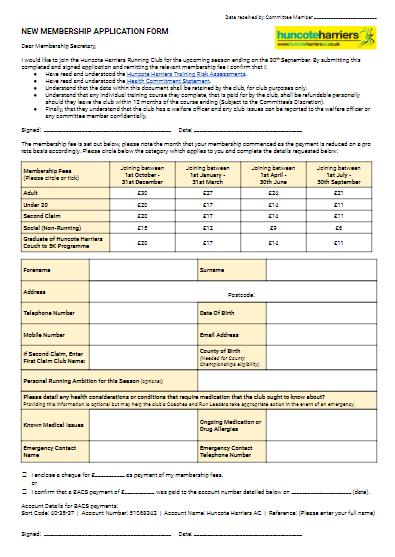 The club full membership fee for Runner Members (both Adult and Under 20) includes affiliation fees to UK Athletics. This means that in most races you will be able to pay a discounted entry fee for club runners. Before sending your membership application form, please make sure you have read, understood and agreed to the Huncote Harriers Training Risk Assessments and Health Commitment Statement. Signing the application form confirms you have done this. Click on the Application Form below to open it, print it off and fully complete and sign it. Make payment using one of the options outlined on the Application Form. Submit your completed Application Form via one of the routes outlined in the Guidance Notes enclosed with the form.